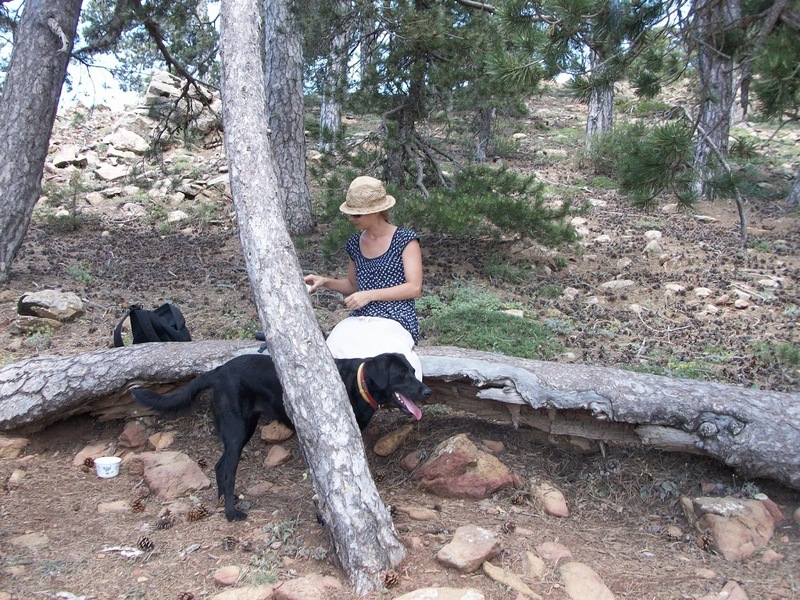 The Artemis Trail starts and finishes at a small parking area at the peak of Mount Olympus. Coming from Platres, continue up past the Troodos resort, following signs for "Mount Olympus". You'll see the small car park, signs for Artemis Trail, and the start of the path on your left after a couple of minutes. We did this hike in mid June. It was already too hot to do anything much done at the coast, but up at the summit of Mount Olympus, it was glorious. 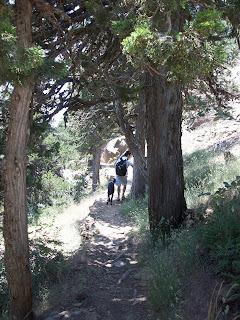 Being at a higher altitude naturally keeps the temperatures low (1952m at the peak), but we also really appreciated the dappled shade of the black pines. I hadn't realised how much I'd been missing woodland. At the start of the hike we met a woman who had just finished her morning walk. She travels up there frequently from Lemesos, to walk her two labradors. They were beautiful dogs, huge and energetic. It may seem like a great effort to drive into the mountains to exercise your dogs, but I could see that it was worth it after just a few metres of the trail. After that we didn't meet a single person. We had the whole pine forest and the magnificent views out over the mountains all to ourselves. The trail passes through areas of dense woodland, where you can spot different types of endemic plant life and enjoy fuller shade. Other areas are more open, and you get some great views, even as far as the sea (either Chrysochou or Morfou Bay, I couldn't tell). You also pass the ski lift, seemingly incongruous if you walk the trail during the summer months. The trail is about 7km. It took us about 3 hours, but we were taking our time and stopped often to enjoy the views. Towards the end of the trail it gets a bit hard going, with a little bit of clambering necessary, however, most of the trail is very flat and easy to walk. For those who are not up for scrambling, it may be best to turn back half way and walk a linear trail. 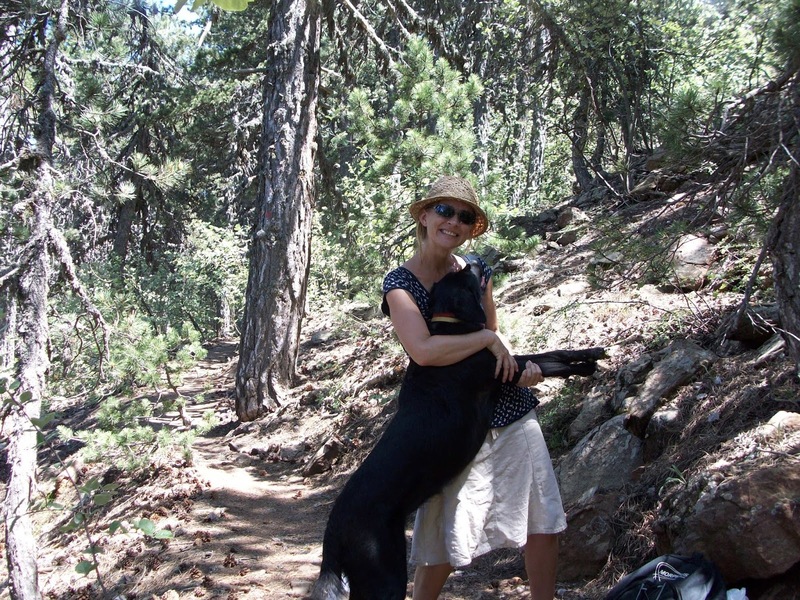 You should definitely carry enough water for you and your dog, there is no water along the way. Sage really enjoyed this walk. It wasn't too hot. There were no wild animals or anxious tourists so we allowed her off her lead. 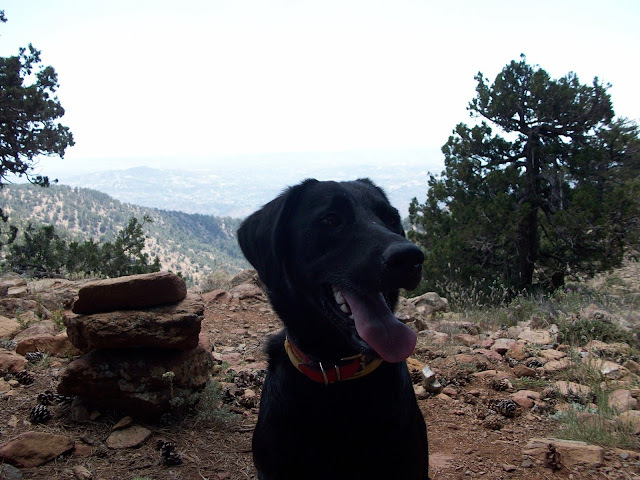 And best of all, she loves chasing pine cones - like a tennis ball but crunchier - and the mountain was strewn with literally thousands of pine cones. What more do you want?